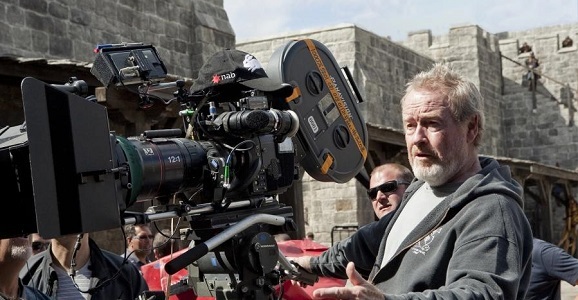 Ridley Scott is about to hit theaters with a trillion pounds of sand for his historical epic Exodus: Gods and Kings, but anyone hoping to see the director make the transition to the small screen is going to be disappointed here. Scott was executive producing the sci-fi project Galyntine for AMC, but the network has decided to pass on it. Apparently, AMC has no use for sci-fi. Here’s how Galyntine was supposed to work: The world fell victim to a giant technological apocalypse that ruined everything for everyone. But a new society evolved from that mess, one that has nothing to do with technology and hates it and stuff. Survivors around the planet are few, and everyone has to learn to survive in their own individual ways. It sounds like it would have been a banging project, but alas it is no more. We have enormous admiration and appreciation for everyone associated with these projects. We are grateful to have ongoing relationships with several of these talented creators and look forward to working together again. Yeah, they also got rid of Knifeman, a Media Rights Capital project that has been in development since early 2012. This drama followed an arrogant genius surgeon who turned his own unique visions into amazing discoveries. Rolin Jones, who has written for Friday Night Lights, was behind this one, which was based on the John Hunter biography The Knife Man: Blood, Body Snatching and the Birth of Modern Surgery, written by Wendy Moore. AMC recently announced that they were getting rid of most of their unscripted series, including Freak Show and Small Town Security, and would focus instead on scripted programming. They’re still holding onto Talking Dead and Comic Book Men, but everything else is going to be fictional. So why would they turn down two shows that sounded so good? They also shot down the the Line of Sight pilot, which was going to follow the cause of a mysterious plane crash. So what does AMC have going forward? That Walking Dead spinoff, for one, as well as the Breaking Bad spinoff Better Call Saul. As far as in-development stuff goes, they’re working with the sci-fi drama Humans and the martial arts drama Badlands. They’ve most recently ordered to series The Night Manager, an adaptation of the John le Carré novel that will star Tom Hiddleston and Hugh Laurie. Put those guys in a sci-fi show, dammit.